The wig size is reference to the doll head circumference that the wig will fit. Most 17” baby dolls have a head circumference of 11 to 12 inches, so an 11-12 wig will fit most 17" baby dolls. If you are unsure of the size wig your doll needs, you can measure the head from the base of the skull, up behind the ears, and over the top of the forehead to determine the head circumference. Click here to open a new window with a free online video tutorial for assembling an Apple Valley doll. In that video it shows you how to correctly apply a doll wig. 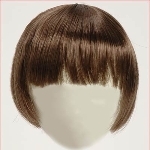 See all of our doll wigs on this page or click the links below to see only a range of wig sizes. Don't forget to pick up the right glue! Secrist recommends Tacky glue for wig application. Made in the tradition of English Mohair, great value!